Gorgeous Pendant - designed by Beauty for Ashes. Beginning with the base metal of 925 Sterling Silver, We have bonded white gold to it for a non tarnish finish. 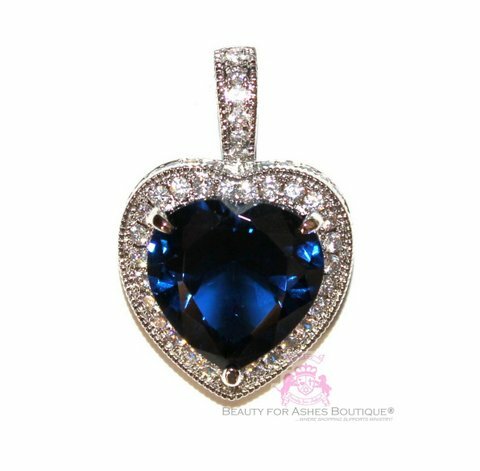 The motif is Heart for Jerusalem - featuring a beautiful sapphire blue cubic zirconia with faceted edges centered amongst a multitude of tiny glittering mini cubic zirconias in clear. An additional layer of the mini cz's surround the entire side of the heart and bale. The bale features an opening clasp, in which to place on our circle necklace for a glamorous look. The circle necklace is for sale in our store on a separate listing. Entire pendant measures 1" across by 1 3/8" high including the bale. Heart for Jerusalem Sapphire Blue Ring - Special! ~ Sizes available are 5, 6, 7, 8, 9, 10 or 11. This Heart for Jerusalem ring is the highest quality Deep Sapphire Cubic Zirconia available. Gorgeous mini cz's in clear and and a beautiful deep sapphire blue heart CZ. The center canary cubic zirconia measures 10mm x 10mm. The entire heart design measures about 15mm across and 13mm from top to bottom. The side design measures about 6mm wide and 2-4mm thick slim on the back of the ring and going thicker towards the front. The back portion of about 20mm in length does not have a design, it is plain with the same shape with a smooth rhodium (white gold) plating with a shiny finish for comfort. This beautiful pair of Sterling Silver earrings feature the highest quality in sapphire blue cz's available. Gorgeous mini micro cz's in clear not only surround the main heart in deep sapphire blue, but also are repeated on the sides of the heart for even more glamour. The center sapphire cubic zirconia measures 1/2" x 1/2". The entire heart design measures about 3/4" across and 3/4" from top to bottom. The side design and bale feature encrusted cubic zirconias in clear. Earrings style is fish hook for ear comfort. This awesome bracelet features the highest quality sapphire blue cz available. Gorgeous mini cz's in clear and and a beautiful deep sapphire blue heart CZ. The center sapphire cubic zirconia measures 3/4" x 3/4". The entire heart design measures about 1" across and 1" from top to bottom. The side design measures about 1/2" wide (side) and about 1/4" (back)on the back of the bracelet and going thicker towards the front. Most of the back portion of does not have a cz's, it is plain with the same shape with a smooth rhodium (white gold) plating with a shiny finish for comfort.